The year is 1973 and winter is in full swing. Nixon is embroiled in Watergate, the US is ending its involvement in Vietnam, and New York’s World Trade Center is on track for its grand opening. Amidst all this national news, in their small corner of the country, Dave Cilley and Henry Barber are about to create their own niche piece of history as they start up the ice-filled gully below the prominent Armadillo feature in Baxter State Park, Maine. Utilizing ice axes, heavy ropes, and climbing hardware that could only be considered primitive by today’s standards, Cilley and Barber will battle their way up 1000 feet of snow and ice to the top of the gully, where they will stand victoriously on Katahdin’s infamous Knife’s Edge. After their ascent, many will describe their line as the boldest ice climb in the country. The Cilley-Barber Route will remain one of the proudest climbs in the Northeast for the next 45 years, enticing brave alpinists who dare to make the trek into Maine’s vast wilderness to do battle with Mt. Katahdin. I’m sitting in the passenger seat of Matty’s truck as we bump and bounce along the dirt road leading into Baxter State Park. The sky is blue, the temperatures are warm, and our excitement is starting to boil over after building throughout our five-hour car ride. “Do you think it’s going to happen this time?” I ask Matty as our conversation turns to our climbing itinerary. Most people make the trek to Katahdin only once a year. The almost comically-long approach to the Chimney Pond basecamp drains climbers of their energy and frequently makes them question their life choices that led them to the experience of skiing 32 miles round-trip while dragging a 50 pound sled behind them. This will be our third trip to Katahdin in two and a half months. Additionally, it will be Matty’s eighth trip in total. In all previous years he has never once been able to climb the seven pitches of Cilley-Barber and stand in the first ascensionists’ footsteps on The Knife’s Edge. During our first trip of the 2017-2018 season, we were met with unseasonably warm temperatures. Having prepared ourselves for sub-zero conditions, our group of four was actually quite relieved and held out hope that the warm conditions would make for a comfortable outing during our four-day trip. Upon our arrival at Chimney Pond, a ranger shared the bad news with us: steady warm rain had decimated almost every route on Katahdin. We climbed an alternate objective then headed home the next day. The second outing a couple months later directly followed the Northeast’s second nor’easter in a single week. Matty and I made the trek in nonetheless, but upon our arrival we discovered the route still hadn’t recovered from the warm temperatures, and the new snow made it nearly impossible to break trail to the climb in the first place. We instead opted for a hike up to The Knife’s Edge. We broke trail through chest-deep snow for three hours before giving up and heading back to the cabin. When we returned to Chimney Pond soaked from snow and sweat, a ranger arrived bearing more bad news: a third nor’easter was on its way, carrying with it a forecasted 30 inches of new snow. Matty and I made the call to evacuate the cabin the next morning ahead of the storm. So here we are, round three. Round eight for Matty. We had shifted plans around, checked the weather forecast religiously, and revised our plan of attack. We’re visiting the park on some of the last days before it closes for the spring season. This will be a speed run by Katahdin standards. Fat bikes will aid our long approach to Roaring Brook Shelter. Instead of continuing up to the Chimney Pond shelter from there like so many people do, we will instead set up base camp at Roaring Brook. We’ll get an alpine start on day two, trek the three miles up to Chimney Pond, climb Cilley-Barber, summit, and head back down the Knife’s Edge and all the way back to Roaring Brook. This “light and fast” attempt will involve about 10 miles of hiking, 7 pitches of climbing, and 3500 feet of elevation gain. On day three we will plan to cruise all the way back to our cars on the fatbikes, hooting and hollering the whole way out after a successful climb. But you know what they say about plans. We’re on our bikes for about two minutes before we both realize we’re in for a long day. Even though both of us have years of experience riding and racing bikes, we’ve both made the fatal error of forgetting our bike shorts at home. It’s been a while since I last got on my bike, and it shows in my behind’s inability to cope with the thin padding of a bike seat, exacerbated by an extra 35 pounds of climbing and camera gear sitting on my back. Within an hour, every pedal stroke is agony. Our only solace is that we are making quick work of the approach. The snow warms up and makes for trickier pedaling as we continue towards our camp for the evening. We eventually pull into Roaring Brook and throw our bikes to the ground. I’ll be happy if I never have to see that bike again in my whole life, but I know it will be waiting for me in just a short day and a half. We make dinner and plan for the next day. The ranger comes in and shows us a photo of the crux of the route. Steep mixed climbing leads way to a wall of ice. The lower ice looks thin and verglased, and the ranger tells us that the moves below the crux are incredibly difficult to protect in current conditions. After the ranger leaves, Matty and I discuss our plan and decide to go for it. We’re up at 4am under headlamps the next morning, and we’re halfway to Chimney Pond before the sun comes up. Upon arriving at Chimney we stop to chat with the Ranger and head towards the base of the route. All the snow from the nor’easters a couple weeks earlier has set up well and it’s easy-going on the approach. 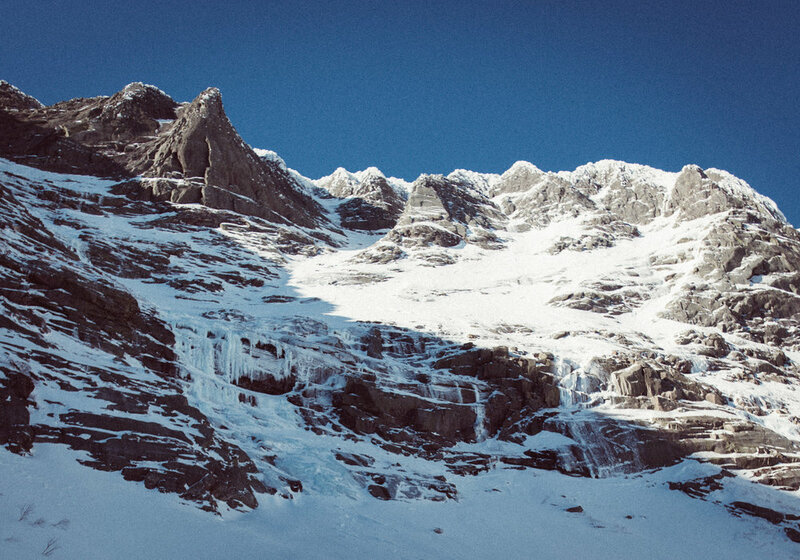 We arrive at the base of the climb under blue skies and look up at the looming first two pitches of near vertical ice. We can’t see over the ledge above us; we simply have to trust that there is still ice up there somewhere. Matty racks up for the first lead, I put him on belay, and we’re off. He makes quick work of the first pitch, I follow up, and we swap leads. The climbing is stout and steep, but we move efficiently and smoothly, the benefits of climbing together all winter. We clear the ledge at the top of pitch three and trudge through the snow up towards the next pitch of ice under the looming Armadillo. Matty takes the short pitch of ice and bouldery rock moves, then we swap leads again as I lead up the steep verglased snow towards the base of the crux pitch. Arriving at the belay stance, I look around in confusion. This is different than what I’ve seen on trip reports and heard from other climbers. There is seemingly nowhere I can place reliable rock gear to build an anchor, and we are about to head into a crux pitch; a leader fall is a real possibility. I search the rock frantically for the next 10 minutes, downclimbing then ascending again, placing gear then removing it when I’m not confident with its holding strength. Suddenly, a lightbulb goes off: I’m standing about six feet higher than normal thanks to the three nor’easters that dumped snow on Katahdin in the past month. All the good placements are near my feet. I lay down on the snow, look up, and spot it – a couple parallel cracks facing downwards. I pop a couple cams and a stopper into the slots, build my anchor, and yell down to Matty. He quickly reaches me. I wait for him to say something about the inordinate amount of time it took for me the build the belay, but his sights are instead laser-focused on the tricky pitch ahead. What normally stands as a straightforward 50 feet of near vertical ice has been altered significantly by the rain and warm temperatures, leaving us with a mish-mash of ice chunks and verglased rock leading to an overhanging parasol for the final moves. “What do you think?” I ask Matty. Good thing. I’m sure as hell not leading it. Matty grabs his gear from me and I put him on belay. He places his tools and crampons delicately as he heads up the thin ice-covered rocks at the start of the route. As he makes his way higher, he plugs in a 10cm stubby ice screw and proceeds to bottom it out on the rock below. I can’t see much from where I am standing, taking shelter from the falling debris in the small alcove under the belay station. As I try to sneak a peak around the corner to see how Matty is faring, a piece of ice whizzes past my face. I tuck back into my shelter. Matty is moving deliberately and smoothly, as he always does when he is in the mountains. The rope never stops moving for more than a minute or so at a time while he makes his way upward. Suddenly, there’s a crash as an enormous barrage of ice comes careening down the pitch, smashing into the rock above my head and pelting the ground around me. “He’s falling,” I instantly think, and I anticipate the rope coming tight on my belay device. Nothing happens. I listen closely and all I can hear are Matty’s belabored breaths and the sounds of ice tools swinging. I don’t know what’s going on up there, but I don’t dare to leave my protected belay spot. A few more minutes go by and I finally hear Matty yell that he is off belay. He pulls the rope up; I break down my anchor and leave my alcove. “Those were some desperate moves!” Matty yells down to me as I step around the corner. “What the hell happened?” I ask. I look up at the pitch and realize that the bottom half of the parasol is now gone. “I’m glad I wasn’t leading that one!” I yell back as I start up the pitch. The climbing is techy and sequential as I make my way up the ice-covered rocks. Tool swinging is out of the question, so I rely on natural hooks in cracks as I place my crampon points delicately. As the ice gets thicker, the route pitches up, and I soon find myself on the overhanging parasol. Even under the comfort of a top-rope I struggle for good stemming foot placements, and my hands go numb as I overgrip my tools. I finally pull over the bulge at the top, pumped and out of breath. “Holy crap, man. That was a ridiculous lead!” I say to Matty, and he laughs casually, all the nervousness now dissipated. Suddenly, the feeling comes back my hands, and I immediately want to vomit. Ice climbers are no strangers to “the screaming barfies,” a colloquialism describing this very feeling. I yell in pain as Matty chuckles and takes a video of my suffering. A few minutes later, everything is right with the world again and we continue up through the final easy pitches. I take the first lead as we make our way out of the gully, then I swap with Matty as he leads us up to the ridge. He puts me on belay and as I’m nearing the top, he yells to me. For the entire day we have been constrained inside a tight gully, with only the view of Chimney Pond and the rolling mountains to our east, but as I step onto the ridge I am met with an immense view of Katahdin’s rocky flanks and The Knife’s Edge directly ahead of us. We sit and admire the surrounding scenery for a while. I think back to Dave Cilley and Henry Barber’s first ascent and how impressive their climb was. Matty and I have some of the best tools available in the world. 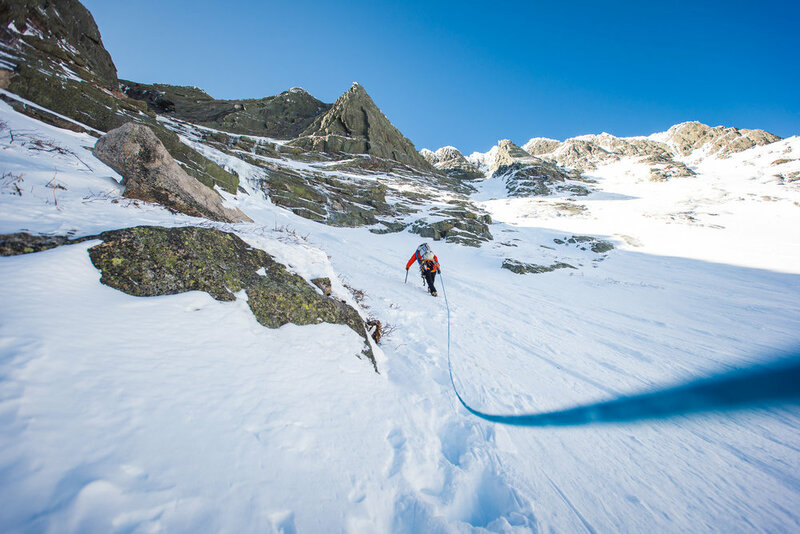 Our aggressive Petzl ice tools have been engineered to swing and plunge as effortlessly as possible. Our waterproof and breathable Gore-Tex outerlayers have kept us shielded from the elements the entire day. Our dry-treated Sterling rope has been sitting for more than five hours in snow and ice and is still bone-dry. The odds were entirely stacked on our side, and even then we struggled with the route. To climb this route with the tools of 1973 seems unfathomable. Eventually we pick ourselves up and make our way along the spine to the top of the ridge, where we walk north towards the summit. After a quick snack at the summit, we turn around and head back down The Knife’s Edge. There is a light breeze in the air as we descend the sharp ridgeline of Katahdin’s glacial cirque. We finish the Knife’s Edge and down-climb The Chimney, a WI2 snow gully that we ticked off on our first trip this winter. 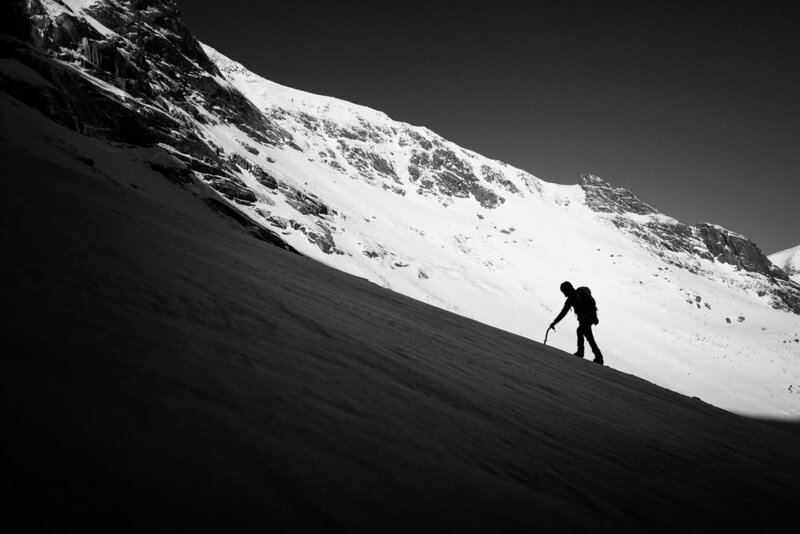 Near the bottom, we strip our crampons and glissade as far as we can go, hooting and hollering as we go. The sun is setting as we reach Chimney Pond and start down the trail to Roaring Brook. The darkness soon descends upon us once again and punctuates the end of a full day of climbing. We’re both still riding high on the energy from the day when we arrive back at the bunkhouse. We cook up some food and prepare for the long bike ride the next day. The next morning, my only hope is that my excitement about the previous day’s successes will slightly lessen the extreme pain of my behind on my bike seat during the 12-mile ride.